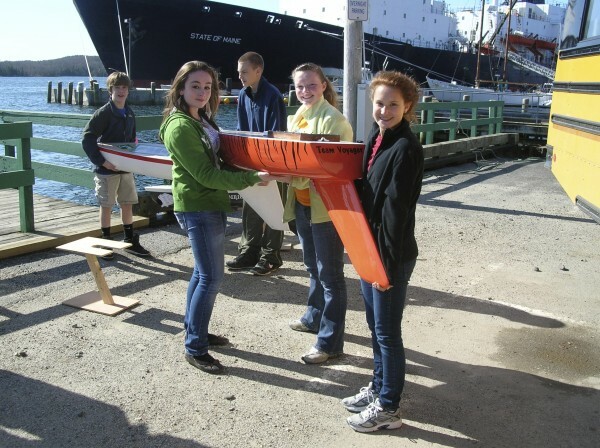 Jessie Sweeney (from left), Mikala Leland and Mariah Dennis, all seventh-grade students at the Reeds Brook Middle School in Hampden, deliver a small sailboat to Maine Maritime Academy on Friday as part of the Educational Passages program they are participating in. Sudents at three schools in Maine and one in Connecticut have worked on the boats since last fall and will track them using GPS technology after they are launched by MMA students on the State of Maine during the ship's annual training cruise, which starts next month. Capt. Les Eadie, interim master of the State of Maine, the training vessel at Maine Maritime Academy, talks with students from the Reeds Brook Middle School in Hampden and Wagner School in Winterport on Friday. The students had delivered small sailboats to the college which will be launched from the State of Maine during the annual training cruise this summer as part of Educational Passages. 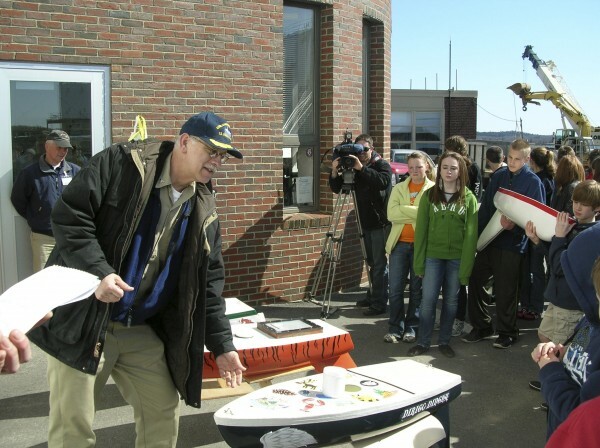 CASTINE, Maine — After working since fall, students at three Maine middle schools and one in Connecticut are hoping for fair winds and following seas that will propel their minisailboats around the Atlantic Ocean. On Friday, students from the Reeds Brook Middle School in Hampden and the Wagner School in Winterport , who are participating in this year’s Educational Passages program, delivered four 5-foot-long sailboats to Maine Maritime Academy. After a few finishing touches, the miniboats will be loaded onto the State of Maine, the college’s training vessel, and launched into the Atlantic during the vessel’s annual training cruise, which starts in May. Each of the small sailboats is equipped with GPS, and the students will track the vessels throughout the summer and into the next school year. “We want ours to go to Europe,” said Reeds Brook seventh-grader Jessie Sweeney. So after studying winds and currents, the students asked that the boat from their school be launched off the coast of Virginia. She added that students also hope anyone who finds the model will relaunch it and send it on its way again. This is the fourth year that MMA has worked with Educational Passages, a nonprofit organization based in Belfast that developed the idea of the unmanned, self-steering sailboats. Over the years, the the program has launched 12 sailboats that rely solely on the wind and the currents to propel them. In that time, only one of them has been lost. The longest voyage was a boat prepared by Belfast students which was launched near Puerto Rico and was retrieved 375 days later off the coast of Portugal. Nearly 50 students are involved in the program this year. In addition to Reeds Brook and Wagner schools, students from the Watershed School in Rockland and the Smith Middle School in Glastonbury, Conn, prepared sailboats for the summer journey. According to Mariah Dennis, in addition to the GPS and a satellite transmitter, the boats include a time capsule of Maine items including a pine cone and a recipe for whoopie pies. While students clearly were excited about the project, the preparations have been a learning experience, according to their teachers. “This has really opened their eyes to things that they’ve probably never thought about before — oceanography, marine sciences,” said Michele Campbell, a seventh-grade teacher at the Wagner School in Winterport. The program has involved the local community, Campbell said, and several community members have worked with students on skills such as reading charts. According to Sharyn Hastings, a seventh-grade teacher at Reeds Brook School in Hampden, one of the attractive parts of the program is that it could be adapted to an interdisciplinary approach. In addition to classroom work, students also visited the University of Maine where two oceanographers talked with them about the forces that would be affecting the boats while they were in the ocean. “We know all the technical terms for the weather now,” Jessie Sweeney said. The boats will be loaded onto the State of Maine before its departure from Castine on May 3 and will be launched at different sites determined by the young students. MMA students get some at-sea experience during the launchings and retrievals, according to Capt. Les Eadie, the interim master of the MMA training vessel. This year, the student crew of the State of Maine also will retrieve a boat that was recovered in Ireland. In the meantime, the new group of potential mariners will monitor the progress of their little vessels online through the end of the school year and will pick up their tracking duties again in the fall.